Welcome to St. Teresa's Avila! Beautiful day! I will let the videos speak for themselves – but it was a great day. The weather forecast was for rain but it was sunny and warm all day. 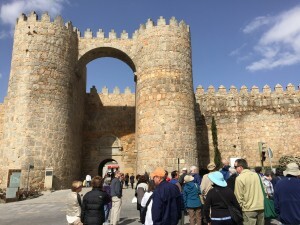 We had planned to visit two nearby cities but I made an executive decision to cancel that so people had a free afternoon and evening in Avila. Good choice – everyone loved the day. We had Mass planned for one place but by Divine Providence and quick action we secured a Mass at St. Teresa’s first convert and were even able to visit her cell and the original chapel. The nuns graciously gave us all Brown Scapulars which were all blessed. We were all given one after Mass. You can watch that video (Video 3). The homily was excellent and I recorded it on video for your edification (Video 2). It was summarizing the life of St. Teresa. Fr. Alfonso Aquilar, from Spain himself. has been an excellent spiritual director along the way. Enjoy!